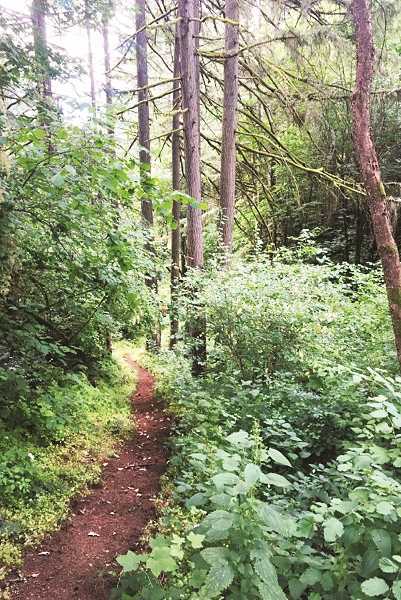 The Chehalem Park & Recreation District held a public meeting Jan. 8 to discuss the future of Bob & Crystal Rilee Park. After 18 months of work, the advisory committee appointed by CPRD presented its proposals for the 325-acre property on Parrett Mountain. According to committee member Wendy Wente, the room was packed with interested citizens and groups, a handful of whom provided their input on the proposals. "It was fantastic," Wente said. "I was so pleased that the public would come out like that. We were hoping for a big turnout, but it was really a packed house." Each member of the seven-person committee had a different "focal opportunity" that they discussed, said Wente, who used her experience as an ecologist and wildlife biologist to focus on habitat restoration. The 36-page proposal, publicly available at www.CPRDNewberg.org, includes six focal opportunities and a section on security and access. The opportunities presented include habitat restoration, equestrian recreational activity, mountain biking trails, a nature play area, community education and secondary uses such as hosting events. It took the committee roughly an hour to outline its proposals to the CPRD board of directors. The board proceeded to ask a few follow up questions before opening inquiries up to the public. "The whole purpose of the meeting was to orient the board to the recommendations," Wente said. "They will go and deliberate the next steps based on their review of the plan." Community education is an integral piece of the proposal. The committee recommends developing a heritage farm, visitor's center, folk school, youth farm, equestrian education center and a garden area. "This area has a long history," Wente said. "A lot of people in the community have lived and worked on the property before its acquisition by CPRD. I think the historical, heritage farm element is a unique thing that is special to this property." Mountain biking and equestrian groups were present at the Jan. 8 meeting, providing their input on how those subsections of the property should be handled. A nature play area was a popular idea in the survey conducted in the fall by the city of Dundee and was one of the main segments of the proposal. Secondary uses include building an area on the property dedicated to weddings and other events. It is emphasized in the proposal that the number of events per year should be limited, so as not to disturb neighbors of the park. A set of rules and regulations for sound was also proposed by a number of people on the survey. Separate from the main focal points but crucially important to the board and public was security and accessibility. Security risks include human-caused wildfire, vandalism, theft, trespassing, property abuse and failure to follow park rules, among other issues. Now, with the meeting finished, the CPRD board will deliberate and develop a master plan for the park – a process Wente said can take up to two years. A timeline has not yet been set, she said, for the next steps of developing the property. With the advisory committee's vision laid out, all that remains is for CPRD to determine how – and when – to execute it. "I don't know how quickly we get to the next step based on these plan recommendations," she said. "But I look forward to the future of this property."